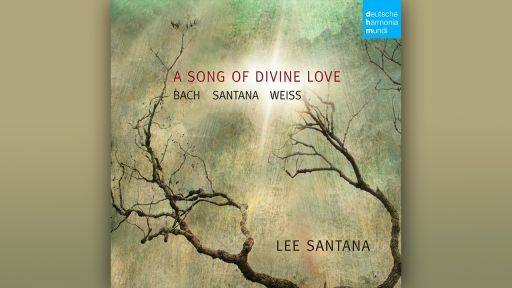 At the heart of Lee Santana's new CD is his own composition: A Song of Divine Love - a worthwhile discovery? The lutenist and composer Lee Santana (born in 1959) is known for its bohemian mix of styles and performances. This is clear from his musical biography, where he mentions that he was first more interested for jazz and rock music in his native Florida and only came to early music and the repertoire for the lute through several detours. He has lived in Europe since 1984, working as a soloist and as a member of several high-profile ensembles. With his latest CD, Lee Santata has succeeded in planning an exceptional program. At the heart of the recording is his own composition A Song of Divine Love for solo lute. Two masterpieces of the baroque repertoire serve as a frame for this piece: Prelude, Fugue and Allegro in E flat major by Johann Sebastian Bach (BWV 998) and a sonata by the Dresden court lute player Silvius Leopold Weiss. Santana wishes for this overall conception to be seen as a kind of meditation (recital as meditation). Accordingly, he interpreted the works of Bach and Weiss quietly and with great contemplation. He chooses rather withdrawn tempos, strives for maximum expression and regularly adds effective rubatos. The movements never sound rushed and a maximum of transparency can always be heard. The highlight of the CD, however, is by all means Lee Santana's composition A Song of Divine Love. The composer was inspired by the 1964 album A Love Supreme by the American jazz saxophonist John Coltrane. Back then, Coltrane produced a four-movement suite for jazz quartet, which, with its multiform expression, triggered great enthusiasm among his fans. In his lute suite, Santana takes the four-movement structure and even some original titles set by Coltrane. However, this is not a mere transferring of Coltrane's jazz style on the lute; instead, Santana goes on his own way here: In the composition there are tonal and atonal moments, jazz and folk passages, classical contrapuntal sections, and above all numerous moments that are quite meditative. In the booklet, Santana also explains the deliberately designed "architecture" of the individual movements, which is based on certain numerical sequences (which is not possible to recognize while listening without a score). But even without this information about the works' construction, A Song of Divine Love is a very rewarding discovery. A person who confronts it will discover many inspirational details upon listening. And when one listens to the Weiss sonata directly afterwards, one has the impression that even his dance movements groove.